The half-day tour from Milan includes the visit of 2 selected wine cellars, specialized in different wine productions. The house enologists will take you for a walk along the vineyards and then to the cellars where vinification takes place, explaining the process in detail. The wine tasting will be accompanied by appetizers, like cheese, grissinis, and cold cuts. The banks of the Po river (Italy’s main river! 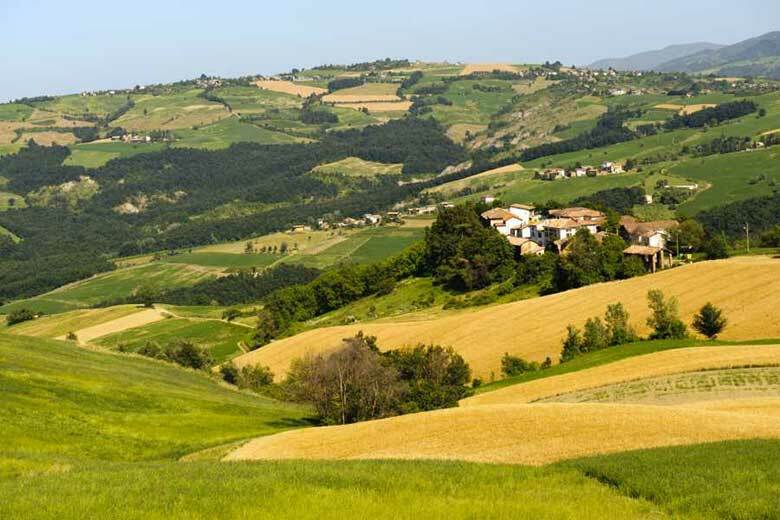 ), its valley, the surrounding hills and mountains: this is the Oltrepò Pavese. All sorts of different types of landscapes are awaiting discovery, ideal for open-air tourism, with innumerable possibilities as regards locations at which to sample the foods and wines of the district. Oltrepò Pavese is famous above all for its hills, which represent an evocative viewpoint overlooking the river, the city of Pavia and the plains, and which provide the ideal conditions for vines. 16,000 hectares of vineyards are used to make excellent white and red wines. On the way to the countryside, you can sight many interesting and ancient towns and villages lying on the slopes. Further up, the hills give way to mountain landscapes, whose peaks reach the 1,600 metres in height. *About the pictures: Vineyard picture by Luigi Rosa (CC BY-SA 2.0); the wine and cheese picture is just an example and does not represent the wine and cheese that you will actually taste during your trip.